Over the last few years, crowd sourced & commercially produced open mapping has come on leaps and bounds, such that it provides a pretty good map chart for most places in the world. Today's release of ViewRanger GPS version 1.3.0 for Apple iOS means that ViewRanger customers can now access and use global open maps on all three smartphone platforms - Symbian, Android, iPhone/iPad. OpenStreetMap - wiki-style map of the world that anyone can edit through services provided by companies such as CloudMade. OSM gives a simple named street layout. Bing Road Maps - the Microsoft owned online mapping tool, provides an alternative view and detail in some territories. 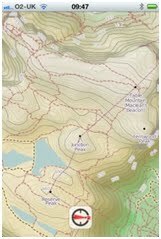 OpenCycleMap (Topo) - this includes rural topographic information, again from CloudMade, and shows contours, tracks and cycleways. 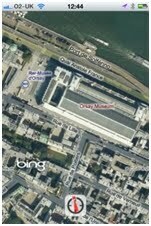 Bing Aerial Imagery - Satellite photo view from Microsoft. All of the features of ViewRanger continue to work with the Online maps layers - you can view your GPS location, record a track and review stats. BuddyBeacon works on Online maps, as does route creation and route import or download. These maps are streamed from the web to your device and will therefore require a WiFi or mobile data connection (for charges check with your mobile operator). However, these maps can also be stored onto your phone for off-line usage. To view any of the online maps in off-line mode i.e. without a web connection, it is first necessary to store all of the area you need in the phone memory. To do this just prior to use - view the map area whilst on-line and it will automatically be stored; to get all of the info you need you will need to zoom into the finer detail layers. Once complete, switch to offline mode. As the phone memory is limited go into settings to change the "cache size" to meet your needs. • Our mapping of the urban environment now includes street name and building details. ViewRanger OpenMaps certainly can't replace the detail and information that you get with ViewRanger Premium map charts - such as those from Ordnance Survey, IGN, BKG, LINZ, or National Land Survey of Finland.